If ultimately approved by the federal government, the Enbridge Line 3 replacement project will involve installation of a new pipeline along the Enbridge right-of way across the Prairies. The National Energy Board (NEB) has concluded that the Enbridge Line 3 Replacement Program is in the Canadian public interest and will recommend project approval to the federal Governor in Council. 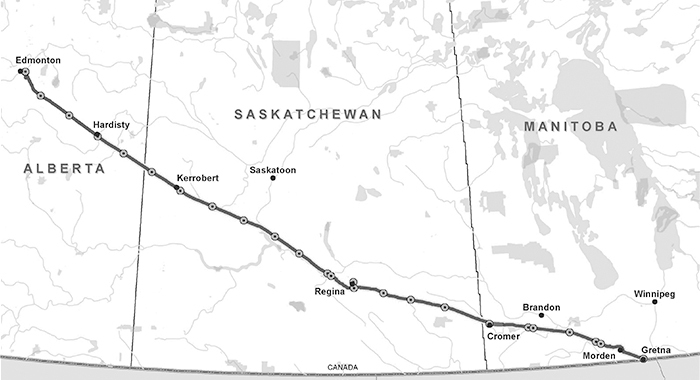 The Line 3 replacement project would be a major project across southeast Saskatchewan and southwest Manitoba. If approved, the project will go ahead in 2019. The Enbridge right-of-way runs through Langbank, Maryfield, and Cromer in the local area. The Line 3 replacement project would involve placing an entirely new line along the right-of-way. The NEB decision follows a public hearing process that included an exhaustive scientific and technical examination of all the evidence brought before the NEB panel. In recommending approval of the project, the NEB noted that the project will replace an aging pipeline with new pipeline constructed to modern standards and therefore make an existing pipeline safer. The NEB has imposed 89 project-specific conditions to enhance public safety, environmental protection, and consultation between the company and stakeholders. The company proposes to operate the new pipeline at the original pipeline’s capacity of 760,000 barrels of oil per day. The majority of construction will occur within a right of way that parallels and overlaps existing Enbridge rights of way, including the Enbridge Mainline corridor. Steve McLellan, president of the Saskatchewan Chamber of Commerce, said he welcomes the NEB decision and hopes the federal government will give final approval soon. McLellan said that he feels Canadian companies are held to a high standard, and pipeline delays mean Canada is importing oil from producers which are not held to such a high standard. “That double standard is the most frustrating thing about the whole issue.” McLellan said. “I have no problem with someone who voices their argument, says here are the issues environmentally or socially that I want to be considered. The NEB has directed Enbridge to develop a plan for Aboriginal groups to participate in monitoring the construction of the new pipeline. McLellan said pipelines are crucial to Saskatchewan. “They’re absolutely critical right now, and they’re absolutely critical in the long term as well. The reality is we’re a land-locked province. If we don’t get the products we have—oil, potash and other things—to the markets that want to buy them, we’re in trouble.